One of the things I’ve been looking forward to is having some guest posts from people who can provide insights into things that I have no knowledge about. I was going to put a request for people to write on some specific topics for Life in Basel, but then a funny thing happened…some people approached me with great ideas for posts for the site! One of these people was Caroline, who had a website called Expat in Basel. Caroline and I decided to trade posts, where I’d write on my experiences in Basel when I first arrived, and how I feel about the city now. Hi! My name is Caroline and I run the website Expat in Basel. I was born in France (just at the border in St.Louis) but I did grow up in Basel and area and I do have a dual citizenship, so I’m almost a Basel native. LifeinBasel.com, asked me to write about how the Swiss locals perceive expats, and what the expat community can do to integrate and be accepted. Your big plus as an Expat living in Basel is you’ll always be interesting for the locals. They are very keen to hear about your home, travels and all your adventures. Most locals, who don’t come around much, are seeking opportunities to speak English, learn more about the rest of the world and interact with foreigners. All you need to do is get out of your comfort zone and try the unknown (I know, you already did that by moving here). What I mean is find places to go and meet new people that are from the Basel area. And if by any chance you do feel comfortable testing out your German, do it, (even better if you want to try Basel Swiss of course!) and you’ll see how thrilled your counterpart will be in hearing that you actually try. We know German is a hard language to learn which is why you’ll always be received with a smile if you try. And if it makes you feel any better: I don’t know any Swiss person who actually speaks proper German. We’re just unable to do so and our accent is the worst you’ll ever hear when we try to speak German. So don’t worry about your pronunciation or accent! Swiss German might come to you naturally, after a while, but nobody is expecting you to either understand, let alone speak it. I have a friend; she’s an Aussie and lived here for many years, married with children. She’s fluent in a mixture of German/Swiss German and that didn’t come over night. So take it easy and don’t be too harsh on yourself. Give it a try, even if it sounds wrong to you, it will sound more charming than you can possibly imagine to the person you’re speaking to. You would never laugh at anyone trying to speak your language, why should the Swiss do such thing to you? 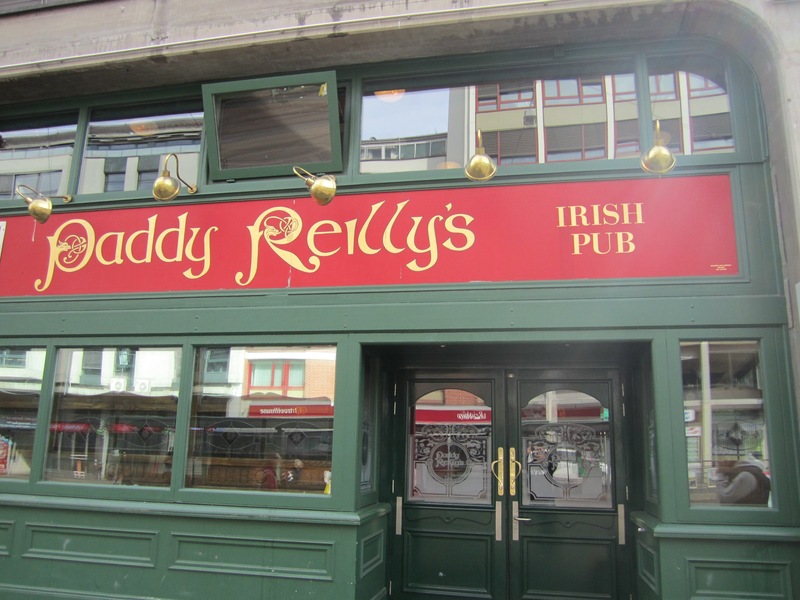 Paddy’s in Basel has a great mix of locals and expats, delicious food, and tasty drinks! If you have children, go visit the Unternehmen Mitte they do have children’s afternoons on most Wednesdays (check their website or stop by to see the program on the posters) that’s a great spot to meet local Moms and maybe get a chance to not only meet new people but practice a bit of German. And if you want to really integrate into the local community, put your kid in a public instead of an international school. If you don’t have kids but would like to mingle with the locals, as silly as it sounds, I’d recommend Paddy Reilly’s . There are tons of locals who just love their Guinness. They are more than happy to speak English and maybe over a pint or two, you’ll find your way to hang with the local crowd and make new friends. And if you like to cook go visit Savoir Faire’s website every once in a while. They organize cooking classes for Expats and locals. The past ones have been a great success and some nice friendships have been made there. In general, as long as the Basel native can see you’re actually trying to reach out and that you are no alien they’ll be bombarding you with loads of questions. Don’t be offended about any prejudice they might have. They most probably assume you’re a millionaire and don’t do anything yourself but swim in your cash and enjoy life. And that opinion is only sticking around because of some huge Pharma firms that have CEOs making loads of money and claiming to only find good staff outside of Switzerland. It’s like everywhere else in the world: you always need to get to know people before you can become friends. The Swiss are no different at all. They might just be a bit shy at first. Enjoy Basel! Enjoy Switzerland and all it has to offer! Thanks, Caroline!! Feel free to leave comments for Caroline below; we’ll make sure she gets them. And if anyone has something that they think would be of interest for the site (i.e. for people who are thinking of moving to Basel, Switzerland or for those who have newly arrived), please don’t hesitate to get in touch: admin@lifeinbasel.com! If we think your idea is a good one and you are a good writer, we can talk about you writing a post for Life in Basel!